French police have shot dead the man who attacked Strasbourg's Christmas market on Tuesday, the interior minister has said. 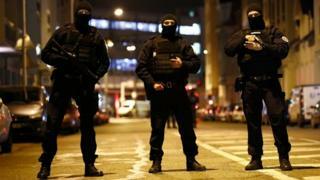 A police unit came across Cherif Chekatt in a Strasbourg street and shot him after he opened fire. Three people have died following the shooting at the market and several more were seriously injured. Strasbourg mayor Roland Ries said that finding Chekatt meant the worried people of his city would now be able to return to a normal life. The city's Christmas market, which attracts two million people every year, is due to reopen on Friday, and Mr Castaner is due to visit it. At about 20:00 local time (19:00 GMT), a man opened fire close to the famed Christmas market near place Kléber, which attracts thousands of visitors. He was the subject of a "fiche S", a watchlist of people who represent a potential threat to national security. Three people died in Tuesday's attack, according to a new toll from the local préfecture on Thursday. One of the five seriously injured in this attack has been declared brain-dead, said the Paris prosecutor's office on Thursday.